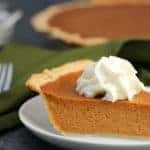 Maple Pumpkin Pie recipe, a Canadian adaptation on carnation's Classic Pumpkin Pie recipe. The combination of the two really does bring it over the top! Preheat oven to 350°F (180°C). On floured surface, roll out pastry to 1/8-inch (3 mm) thickness. Fit pastry into 10-inch (25 cm) pie plate; press into bottom and up sides of plate. Trim overhang and flute edges. Whisk together pumpkin purée, sugar, eggs, flour, spices and salt in large bowl until smooth and well combined; gradually whisk in evaporated milk and maple syrup. Fill pie shell with evaporated milk mixture. Bake in bottom third of oven for 60 to 70 minutes or until set. Let cool completely on rack.